The entrepreneur spirit is alive and well in the Lynchburg Region, particularly in downtown Lynchburg, which is experiencing an exciting comeback, thanks to revitalization efforts. 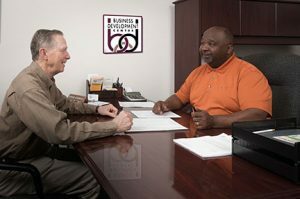 Assisting hopeful entrepreneurs is the Business Development Centre, Inc., in Lynchburg, which provides new and existing small business with management assistance, cost effective space, counseling, training and funding in an environment that encourages the development of local businesses in Lynchburg and the surrounding counties. The business incubator houses start-up and emerging businesses in a variety of types and sizes of space. In-depth counseling and business-related training classes, seminars and workshops are also provided, along with direct financing to small business owners with a variety of loan programs and gap financing. What began as a hobby for Carl and Mary Matice has blossomed into a thriving business. 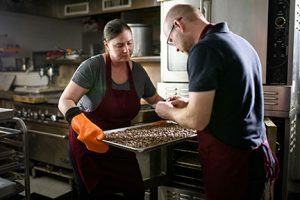 Altus Chocolate, located on Main Street in downtown Lynchburg, is an outgrowth of their consuming passion for making chocolate. Here they hand craft “bean-to-bar” chocolate, which is chocolate made straight from the cacao bean with no fillers, artificial flavors, or preservatives. The Chocolate Lounge in the Main Street location has an old-world European chocolate house flair with cozy seating. Hot chocolate, locally roasted coffee, and espresso are on the menu with a selection of high-quality teas and chocolate pairings. Founded in 2006 by educators Darla Edwards, Stefanie Prokity and Hilda Stevens, Successful Innovations finds meaningful ways to increase student achievement by equipping parents with the knowledge necessary to support their child’s education. 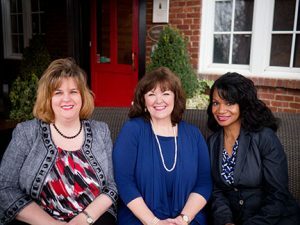 Working in schools with a large percentage of students on free and reduced lunch, the three women became concerned about the ever-increasing achievement gap and decided to try out their ideas in their Amherst County schools. Their ideas worked, and as a result, their schools saw significant gains in student achievement—to the point of being recognized by the United States Department of Education. Now Successful Innovations offers on-site consulting and training for teachers and principals on creating collaborative partnerships with parents. The company also provides a software service that is a subscription site for streaming videos and books. The women have written four books, which are used in the U. S. and as far away as New Zealand. This year, Successful Innovations will hold its seventh National Family Engagement Summit, which draws educators from all over the U. S. Keynote speakers, presenters and panels of experts provide information on best practices along with helpful tips and strategies for grades K-12. Liberty Unniversity juniors Morgan Parry and Nathan Pritchard raise egg-laying chickens. Three Liberty University students have established Wholesome Harvest, LLC, a new company to grow fresh crops and educate the community about responsible stewardship. 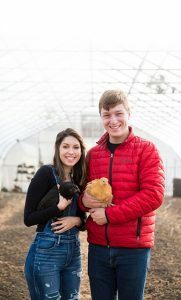 Juniors Morgan Parry and Nathan Pritchard are using land and facilities at the former campus farm on Liberty Mountain to grow flowers and raise egg-laying chickens. Senior Ryan Coble takes care of the business end of things. The land is currently leased to LandTech, a landscaping and pool construction company, owned by alumnus Wayne Melnacon, who has arranged to let the students use the land for free. Morgan and Nathan’s idea was developed through the Entrepreneur’s Center’s Spark! Incubator Program. The students plan to sell their flowers to local florists and students and offer cut-your-own-flowers on site. The students are raising chickens and plan to sell fresh eggs to local grocers. They also plan to grow produce to sell at farmers’ markets. The students are establishing relationships within the community including the Region 2000 Workforce Development Board and Lynchburg’s 4-H Club. Their goal is to educate inner city youth about sustainability, growing their own food, and basic business principles. Eventually, they would like to invite school children to manage their plots on the property. Meanwhile, they plan to host school groups for educational events and offer community service opportunities for Liberty students.